I don’t know how intimidated they felt, but Sufjan Stevens. Robyn and Hot Chip and all the other contributors to the recent 2-CD Arthur Russell tribute album should have felt a bit daunted. How can you do justice to someone as idiosyncratic – at once so transparent and so elusive – as Arthur Russell? Plus, he comes at you in so many incarnations : neo-classical minimalist, alt-pop singer/songwriter, mutant disco pioneer, experimentalist with voice, cello and electronic FX… Its hard to know where to start. Russell died in 1992, just before his 41st birthday. It has been only in the last ten years – after the re-issue programme of his work began in earnest – that Russell’s music has finally started to reach a wide audience. Other artists (and early starters like Jens Lekman deserve special credit here) have always loved him. His voice is so airily tensile, and his sense of humour is so wry that its hard not to love him, no matter how dissonant the foreground noise may be. For starters, “A Little Lost” is one of the best songs ever about kissing. “I’m just so busy, so busy / thinkin’ bout kissin’ you / and how I want to do that.” It’s a song about what we’re doing, as opposed to what we want to be doing. And yes, that is Jennifer Warnes singing with him on ‘Keeping Up’…The great thing about Russell being a cellist is that it gave his music so much airy space, while sounding like every nerve in his body was exposed. This is Disco Arthur, if you focus only on the rhythm track. A great song, with a line that describes love and companionship in terms you don’t usually hear, even in love songs: “It’s a talk in the dark, it’s a walk in the morning…” The picture in the video for “Our Last Night Together” features Russell on the left and in the centre, his long time partner Tom Lee, the curator of his legacy and a likeable presence in the Wild Combination documentary. All these songs feature Arthur in his James Taylor meets David Byrne guise, as a singer/songwriter. The first two tracks are from the Flying Hearts band he formed briefly with Ernie Brooks, previously with the Modern Lovers. “You Can Make Me Feel Bad” is a great example of his gift for melody, even under a surface layer of noise. 4. “Goodbye Old Paint.” Jess Morris/Arthur Russell. Great performances, in both cases. Jess Morris was an old man in 1942 when he recorded this version of “Goodbye Old Paint” for the folklorist John Lomax, and he sounds it. Morris had been the real deal, a former cowboy on the XIT Ranch in Texas, a gigantic 3 million acre enterprise created in 1881 in a cash-for-land swap to pay for the Texas state Capitol building. As a seven year old child, Morris had learned “ Goodbye Old Paint” from an ex-slave called Charley Willis, who’d worked as a horse wrangler for Morris’ father. Originally, Morris learned to play the song on the jews harp, but later transposed it to his fiddle. The singing and playing are wildly plaintive – it sounds like the land itself is singing the song. 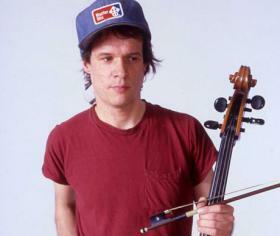 About 35 years later, Arthur Russell did his own version of the song, transposing remnants of the Morris original yet again, to his cello. Everyone to their own taste, but the disco stuff (“ Go Bang” etc) is the only part of Russell’s work that sounds dated to me. On “Lets Go Swimming” the Walter Gibbons remix helps a lot. “This Is How We Walk On The Moon” on the other hand, is simply sublime.